A real contender for the Vend�e Globe. It’s the sort of day that would have all but the most masochistic of cruising sailors reaching for the engine start button. The sun beats down on a smooth as silk Solent sea, barely troubled by a gentle breeze. I’m happy enough though, skimming along at an apparently effortless 8.5 knots. That’s the beauty of Open 60 sailing. I’m sailing with one of the UK’s most experienced offshore sailors, Brian Thompson, aboard his entry for the gruelling 2008 Vendée Globe singlehanded around the world race, Pindar. Brian’s back catalogue shows a string off successful campaigns on a wide variety of boats, both crewed and singlehanded, from Mini Transat to mega multihulls with plenty of races won and 25 records broken to date. 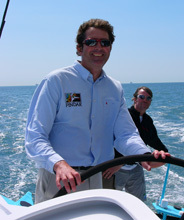 As skipper of Maiden II, in 2002, Brian established an outright 24 hour distance record of 694.7 miles in 24 hours. As a skipper he appears calm and inclusive with an infectious enthusiasm for sailing that spreads through to even the least experienced crew members. Brian cheerfully admits that he probably hasn’t spent enough time in the gym but he seems unfazed by the physical demands that the Vendee, famously, throws up. As four fit guys, grinding hard, took nearly 4 lung bursting minutes to raise the mainsail, a less experience skipper might be wondering what he’d let himself in for. Brian sees his multihull experience as a real plus here. 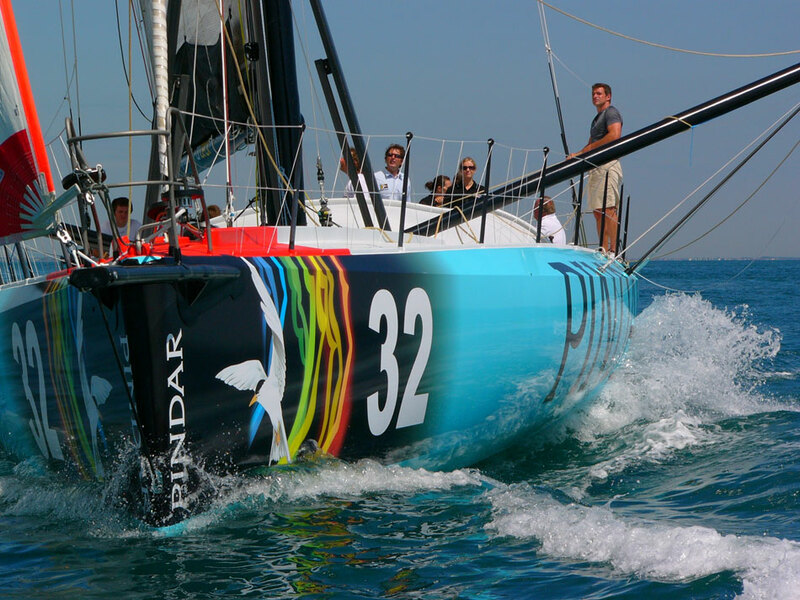 “Coming from big multihulls most of the forces involved in this boat are less than I’ve experienced previously. I’m comfortable with them and I see that as an advantage. In cats, you spend a lot of time throttling back trying not to break the boat. An Open 60 can be driven flat out more often”. So what’s it like to sail an Open 60? Well, after you get over the initial confusion about what makes what happen, there is a universal boat logic that emerges. Halyards pull sails up, sheets control them and winches tame the forces. At low speeds the helmsman gets very little feedback from the twin rudders, which leads to low input requirements from the autopilot, but the boat feels nimble and responds easily to course changes. It was noticeable when tacking, that coming out of a tack slightly free and working your way up to the optimum course, as speed builds, pays dividends. If you stall, the boat takes a while to get going again. As Open 60’s go Pindar is pretty extreme, with its beefy aerofoil mast and outriggers and a decidedly beamy hull profile. Its accommodation would have a Spartan crying for his mummy, with not even a seat at the nav station. Attention to weight saving detail is in constant conflict with keeping Brian fit, healthy and alert for the around three months duration of the race. One burner camping stove and a plastic bucket toilet are already in place and a bean bag type seat is under consideration. In the light and tranquil conditions that we experienced it’s hard to imagine the brutality of conditions onboard in an open water gale. We spent much of the day sailing in company with Alex Thomson on Hugo Boss and, for what it’s worth, Pindar seemed to me to have a genuine advantage up wind, in this wind range. This British campaign is well funded, has a state of the art boat and a battle hardened skipper with winning ways. 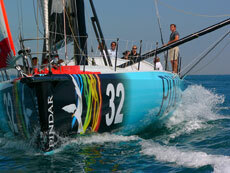 The team has three months to optimise the boat before heading for the start line. 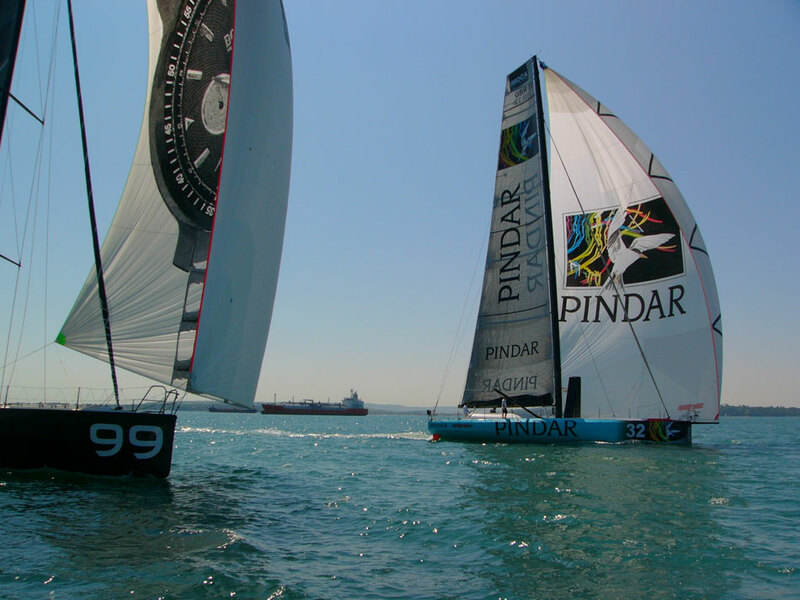 With a little luck and a fair wind, Brian Thompson and Pindar could be in contention when the Vendée Globe fleet storms back to Les Sables d’Olonne. Check out the Ocean Racing section of the BYM News photo gallery.